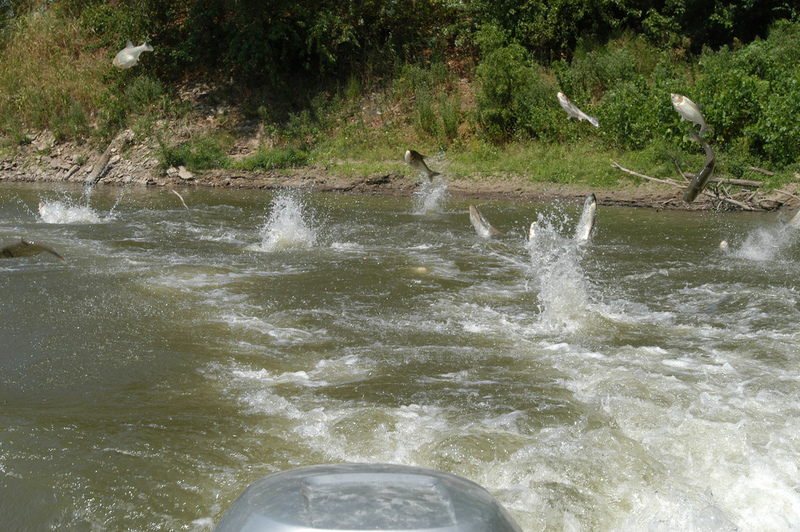 School of Jumping Silver Carp (A species of Asian Carp). Photo by Jason Jenkins. (August 7, 2017) — Today, the U.S. Army Corps of Engineers (Corps) released a draft study of alternatives for improving defenses at the Brandon Road Lock and Dam, near Joliet, Illnois, to prevent Asian carp from swimming closer to the Great Lakes. The National Wildlife Federation says that the Corps’ Tentatively Selected Plan (Plan), which uses a combination of structural and non-structural technologies, looks promising. The Corps analyzed six alternatives, which included no additional action, non-structural alternatives, closing the lock completely, and various combinations of structural technologies including an engineered lock, complex noise, water jets, electric barriers and a flushing lock. The Plan essentially combines all of the structural alternatives along with additional mooring areas and boat launches for rapid response, which the Corps says reduces risk of Asian carp transfer to the maximum extent while still allowing continued navigation. The release of the plan kicks off a 45-day comment period ending September 21. The Corps will also hold two public meetings at locations to be determined.